Geeta Bali's dancing eyes and her animated, expressive face which mirrored her soul were her most outstanding features. Yet life was snatched away from this vibrant personality at an achingly young age of 35. It is some consolation that Geeta crammed a lot into her short life: 70 odd films in a ten-year career. She married struggling actor-turned-megastar Shammi Kapoor and mothered two children: a son and a daughter. Today, she is remembered as a wonderfully natural actress and a fabulous human being. True, Geeta's reputation as an actress rests more on her performances than her roles. Natural, spontaneous and gifted with a spot-on sense of comic timing, she never really found a vehicle worthy of her talent. Largely a shade better than the movies she starred in, she frittered away her talents in B-grade films. Probably the fact that she was born into a family that had to struggle for sheer survival and the fact that she reached the top through sheer grit had Geeta stress on quantity rather than quality. Film lore has it that when mentor [filmmaker] Kidar Sharma first met Geeta, she was living with her family in somebody's bathroom! 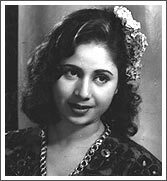 Geeta, who was born Harikirtan Kaur, had done a few small-time dancing roles in pre-Partition Punjab in films like Badnami, before moving to Mumbai. Impressed by her off-screen vivacity, Sharma cast Geeta in his Suhaag Raat (1948). Audiences related to her instantly and watched wide-eyed as she nonchalantly tossed her unconscious hero, Bharat Bhushan over her shoulder in a scene. Soon, Geeta was inundated with contracts (that's what they called film offers then). She accepted most. She won raves even in supporting roles like in the 1949 Suraiya starrer Badi Behan and the Madhubala starrer Dulari. In 1951, she became a major star with Guru Dutt's first hit, Baazi (she went on to do three other films under his direction). Geeta played gangster's moll with a golden heart to Kalpana Kartik's conventional heroine. But Geeta played her role with such gay abandon that hero Dev Anand divulges, "People came repeatedly to theatres to see Geeta's spirited dancing to Tadbeer se bigdi hui taqdeer bana de. Geeta proved she could do tragedy (Sharma's Raj Kapoor starrer Bawre Nain) or and play the lighthearted heroine to comedian Bhagwan in the super successful AlbelaAlbela's swinging C Ramchandra composed songs like Shola jo bhadke and Sham dhale mere khidki tale made front-benchers dance with the stars and even fling coins on screen. Pug-nosed Geeta was no conventional beauty, but that transparent face and that smile constantly flirting on her lips made sure you couldn't tear your eyes away from her. Watch Geeta Bali in the Guru Dutt-directed Jaal (1952). Dev Anand, a cigarette-smoking smuggler on the run from the police, tries to entice morally upstanding heroine Geeta into his web. Geeta evocatively communicates her struggle against, and her eventual surrender to, handsome Dev's seduction call Yeh raat, yeh chaandni phir kahan. Famously down-to-earth despite her star status, Geeta was the antithesis of the coy 1950s' heroine. She often drove herself to her premieres in an open jeep. Those who knew her claim she was a Samaritan who touched the lives of whoever she met. She is said to have personally groomed Mala Sinha, then a newcomer. To date, 35 years after her death, her secretary Surinder Kapoor's (Boney Kapoor's father) productions begin with a shraddhanjali to Geeta Bali. Shammi Kapoor entered her life when they worked in the quaintly named Miss Coca Cola and Coffee House together. On an impulse, Geeta played a small role of a man in Sharma's Shammi Kapoor starrer Rangeen Raatein. On the film's Ranikhet outdoor, Shammi and Geeta fell in love. Kapoor was a year younger to her and was not yet a star, but the twosome were hell bent on marrying each other. Geeta had worked with Shammi's eldest brother, Raj Kapoor in Bawre Nain, and with his father, Prithviraj Kapoor in Anand Math, Shammi was unsure about their reaction to this match. But on August 23, 1955, with producer-director Hari Walia as witness, the couple were married at the Banganga Temple at 4 am. Geeta continued to work after marriage in a few films like Sohrab Modi's Jailor (1958), where she won raves as a blind girl. With Shammi Kapoor turning into a huge star and the birth of her two children Aditya (nicknamed Mickey) and Kanchan, she eased her workload. The desire to do that one fulfilling role she would be remembered for prompted Geeta to attempt the production of a classic for herself. She started Rano, based on Rajinder Singh Bedi's famous novel, Ek Chaddar Maili Si, based on a widow's remarriage to her brother-in-law. Upcoming star Dharmendra played her hero. Geeta, who had not been vaccinated for small pox, contacted the dreaded disease while shooting the film. The best care was rushed to her, but her fever apparently reached 107 degrees. Her doctor saw a picture by his patient's bedside and asked who the pretty lady was. The disease had so wracked Geeta's frail frame that he didn't recognise her as the same person! Geeta Bali passed away on January 21, 1965, leaving behind eight-year-old Aditya and three-year-old Kanchan in the care of a devastated Shammi Kapoor. Ironically, she was cremated in Banganga, not far from where she was married. (c) 1996 - 2002 rediff.com India Limited. All Rights Reserved.